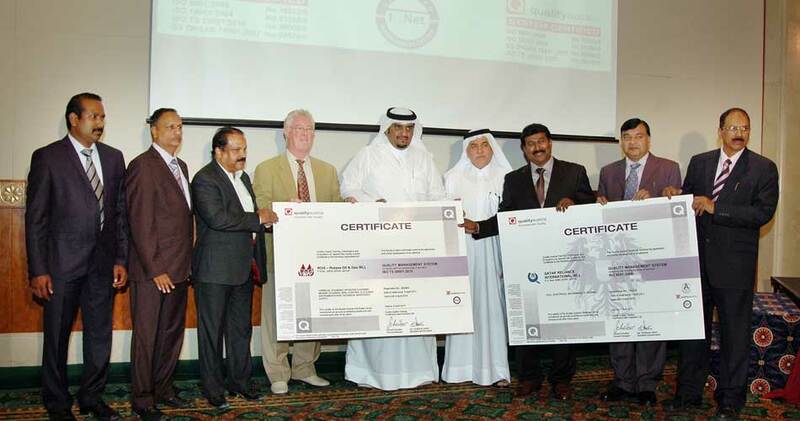 Event Title : 3 NEW CONTRACTS WITH QCHEM - QATAR CHEMICAL CO. SIGNED. Description : 3 NEW CONTRACT SIGNED BETWEEN Q-RELIANCE AND QCHEM - QATAR CHEMICAL CO.
3. QATAR CHEMICAL CO UPGRADATION OF PUMPS FOR NAO UNIT IN QCHEM II, PIPELINE AND PUMP UPGRADTIONS. Description : NEW CONTRACT SIGNED BETWEEN Q-RELIANCE AND QATAR STEEL . Q-RELIANCE AWARDED CONTRACT FOR MAINTENANCE & REPAIRING OF THE ROOF OF THE SOUTH LOGISTICS PRODUCT BAGGING WAREHOUSE INSIDE QATAR CHEMICAL COMPANY. Description : The Pickling and passivation of desalination vessels and Cooling tower base are completed at QAFCO-5 site in Mesaeed. One of our prestigious works, is at completion at the QAFCO-5 site. The desalination vessels made of duplex steel were treated for anti corrosion resistance. They were pickled and passivated. Also the base welds of the Cooling towers were pickled and passivated.